Biopharmaceuticals are large molecules produced by or extracted from biological sources. They are used for therapeutic as well as diagnostic purposes and include recombinant proteins, antibodies, vaccines, blood factors, hormones and many other types of substances. Currently, there are more than 200 biologics on the market and they account for almost a third of all pharmaceuticals under development. These unique substances revolutionized the pharmaceutical industry and brought tremendous improvement to the treatment of many medical conditions. They also brought their own set of challenges in manufacturing, quality control and regulations. Most biopharmaceuticals are developed by using recombinant DNA technology, where specific proteins are produced by genetically engineered cells. As such, biologics are very sensitive to changes in the production process and they are more difficult to characterize than synthetic drugs. Even small changes in manufacturing conditions or cell lines can cause considerable variations in final product, causing differences in therapeutic action. That is why, unlike with synthetic generic drugs, biosimilar compounds require clinical trials to prove the drug equivalency. All cell lines require media to grow and function. 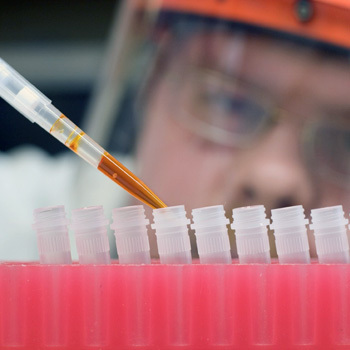 Cell culture media have complex composition that needs to be optimized to ensure proper functioning of the cell lines. The type of media needed would depend on the manufacturing process mode as well as stage of cell line life. For example, media needed for optimum cell growth would be different from the one required for optimized production rate of the final product. Optimum cell media should be able to sustain high cell density and maximized production yield. Amino acids, being the building blocks of proteins, are necessary ingredients of all cell culture media. Since cells can’t synthesize essential amino acids, they must be included in the media to ensure cell propagation and functioning. L-Glutamine is one of the most important essential amino acids since it serves as a Nitrogen source as well as energy source for cell metabolism. Non-essential amino acids also get depleted during cell line lifetime, so supplementation of such amino acids as L-Proline, L-Serine and L-Alanine is also necessary. Monitoring amino acids at various stages of the manufacturing process ensures viability of the cells and high quality of the final product. Due to complexity of composition and structure, biopharmaceuticals are challenging to characterize. A wide array of methods, such as immune assays, gel electrophoresis, different chromatographic and mass spectrometric techniques are used in combination to fully confirm the substance purity and identity. The ICH Q6B is a guidance document that provides a set of internationally accepted specifications for biotechnological and biological products to support new marketing applications. (https://www.fda.gov/downloads/drugs/guidancecomplianceregulatoryinformation/guidances/ucm073488.pdf) Determining amino acid composition following hydrolysis is listed in Q6B as a way to characterize the protein and to confirm its identity by comparing with the amino acid composition deduced from the gene sequence of the desired product. Amino acids analysis data is also used to accurately determine the protein content. Pickering Laboratories offers methods to analyze amino acids in hydrolyzed protein samples and well as cell culture media. See our application notes 373 and 371 for more information.